Ernesto Cardenal is a Nicaraguan priest, poet and politician. He was also minister of culture in Nicaragua at the end of the seventies. Cardenal started a christian commune in 1966 on the Solentiname Islands in Nicaragua in which they lived in poverty among indigenous farmers. This is a record he made in Germany in the early seventies with a couple of christians who were completely out of their minds. Cardenal wrote the texts and the German musicians made the musical adaptations and German translations. The first side of the record is called "Prayer for Marilyn Monroe" and has a completely pedantic and moralistic character. It tells the story of the life of Marilyn Monroe and why it was all a futile effort. 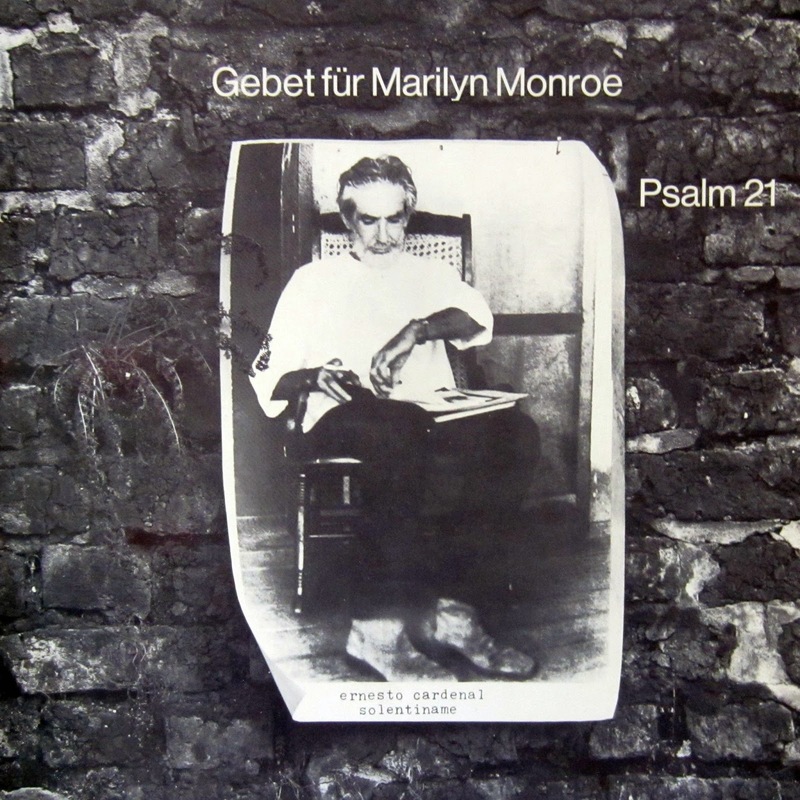 The second song is called Psalm 21 and talks about war, torture and technological problems of the world. Really heavy stuff (I mean the record). The greatest thing about the record is that the German vocalists sing both in German and Spanish. Their Spanish has an insanely strong German accent which makes it incredible. It has a similar feeling to German bands like Floh De Cologne (who would totally hate these christian people) or Dutch hippie flutist Sigurd Cochius who made one album in the early seventies. It's very groovy with amazing flutework. The flutist who is appearing on this record is Klaus Dapper who was also in Krautrock groups like Bröselmaschine and the NWW-List group Kollektiv so this record has a link to some of the proper Krautrock bands as well. UPDATE: I got hold of a new copy of this album, which means the bad quality B-side of last time has been replaced by a better rip. I suggest you grab this pearl again! "Herr, in dieser Welt, die verseucht ist von Sünde und Radioaktivität sprichst Du eine kleine Verkäuferin nicht schuldig, die wie alle kleinen Verkäuferinnen davon träumt, ein Filmstar zu sein. Ihr Traum wurde Wirklichkeit (doch eine Wirklichtkeit in Technicolor), sie agierte nur nach dem Script, das wir ihr gaben - das Script unserer eigenen Leben - und es war ein absurdes Script. Vergibt ihr, Herr, und vergib uns allen..."
Get ready for some amazing Christian Krautrock!